Facing a barrage of well-meaning advice from Democrats panicked about Trump, Clinton needs a shift back to issues. As general-election polls show a worrisome tightening of the likely race between Hillary Clinton and Donald Trump, the Clinton team is beset by more advice—good, bad, and concern-trollish—than at any other time in this campaign. On Wednesday alone, the almost-nominee got three broad and differing critiques that were mostly intended to be helpful, but that instead pointed out the difficulty she’s having projecting her 2016 candidacy against a screen that’s covered in 25 years of nasty graffiti. Yet all three sets of criticism offer insight at least worth pondering as she tries to unify the Democratic Party, learn from, and incorporate the appeal of Senator Bernie Sanders, and turn out the Obama coalition in numbers large enough to defeat the menace that is Donald Trump in November. The most scrutinized woman in American political history will benefit from a campaign built around a broad mandate for change; it’s in her interest to have a vibrant, even occasionally contentious debate with the Sanders team about the party’s goals and values, and then move forward to November with a campaign that’s pushing ideas, not just trading insults with Trump, the human insult generator. But Warren’s delivery also benefits from telling an overarching story about how the system has been rigged by political decisions that helped the rich and hurt the poor. Clinton has yet to go that far. Although her platform promises a long list of reforms that would even the playing field and widen opportunity—from a minimum-wage hike to childcare and preschool assistance to massive college subsidies, stronger labor laws and infrastructure investments—Clinton is not yet telling a story that makes her prescription sufficiently compelling. Just as President Obama’s 2012 campaign took off when he began to incorporate more populist fire, hers likely will as well. 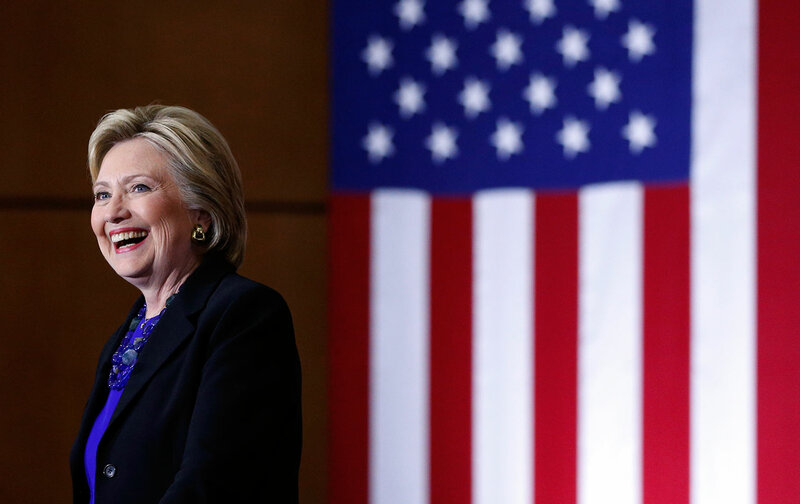 Also on Wednesday came Thomas Edsall’s bad news for Clinton showing her struggles with white men—not just the working-class men who’ve fled the Democrats in recent years but college-educated men as well, where her support has declined from 47 percent to 33 percent just since March. Edsall believes ads by Priorities USA, the Super PAC that supports her, which are trying to drive up her support among women, are hurting her with men. An ad featuring women speaking the noxious words Trump has used over the years to describe women, Edsall believes, merely echoes talk that is “commonplace in the nation’s locker rooms and barrooms” and turns off men who are sick of “political correctness.” I have a lot to say about that, but I’ll save it for another time. Even worse for Clinton, though, is Edsall’s finding that while she’s tacking to the left, at least in part to appeal to Sanders voters as well as working-class white men sidelined by a punishing economy, many voters don’t believe she means it: 71 percent say Clinton “will say anything to get elected”; 65 percent say that about Trump. Personally, I think those numbers will drop when the primary ends, and Sanders stops his attacks. I have to say, as someone on the left who nonetheless supports Clinton, I don’t understand why so many of my ideological compatriots are sore winners about the way Clinton has moved left in the last two years—partly, but not only, in response to the Sanders challenge. Even before Sanders declared, Clinton had made clear she would run on the issues of voting rights, mass incarceration, immigration reform, and an expanded safety net. She was looking to consolidate the Obama coalition, not hark back to the white-working-class chasing (Bill) Clinton coalition. She was moving left because the center of gravity in the party was carrying her that way (and because, I believe, that’s where her values are, those stupid Goldman Sachs speeches aside.) Assuming, as I do, the party unites in Philadelphia, I hope Sanders and his supporters begin to applaud Clinton’s shift left, not deride it as insincere. Finally, the third piece of advice for Clinton on Wednesday came from The New York Times middlebrow philosopher David Brooks, who mulled over the vexing issue of why the Democratic front-runner is so “disliked.” Leaving aside the fact that, much like President Obama, she is mainly “disliked” by white people—African Americans, Latinos, Asian Americans like her a lot—let’s assume Brooks is trying to be helpful, since he remains one of those rare #nevertrump Republicans, at least for now. What’s his answer? I would begin my explanation with this question: Can you tell me what Hillary Clinton does for fun? We know what Obama does for fun—golf, basketball, etc. We know, unfortunately, what Trump does for fun. But when people talk about Clinton, they tend to talk of her exclusively in professional terms. Never mind the fact that Brooks’s entire column never once mentions the word “woman,” let alone acknowledges the gendered thinking implicit in his question about “likeability” or his response. I think it’s flatly untrue that we don’t know enough about Clinton’s interests or hobbies or what she does for fun. In this campaign especially she’s been way more open: She’s discussed her love for television shows like The Good Wife—despite its self-conscious nods to the Clintons’ marital problems—Madam Secretary and Dancing with the Stars. She likes yoga and swimming, and she’s a voracious reader. She’s appeared on the bawdy hilarious millennial favorite Broad City; on Saturday Night Live; with Jimmy Fallon, Jimmy Kimmel and Stephen Colbert, and got rave reviews for each… and then the water splashes over her, and she goes back to being slammed as “humorless.” She’s a doting grandmother, but the right mocks her for it. For 20 years, her friends have poured their hearts out to the media about what a good friend she is, how kind, how funny, how thoughtful. But nothing works—all of it gets dismissed as “pandering” and more inauthenticity. One small example: Also on Wednesday, I was watching her Riverside, California, speech, which was interrupted by two young men in the first row taking off their shirts. The police began to remove the men, but Clinton said they could stay “as long as they didn’t take anything else off.” So they stayed. “I got to admit, it is a little distracting standing up here looking at [them],” Clinton said, chuckling and blushing. “So I’m going to look over this way…” It showed she was funny and quick-witted; it was fun TV. But the network quickly cut to another story; later, it got zero cable-TV coverage (that I could find). ABCNews.com did run a story, and found that they two guys had gone from Clinton-skeptical pranksters to Clinton supporters. So I’ve given up on the idea that being warmer, funnier, more approachable, or less of a “workaholic”—Brooks’s word—will change anything. I think Clinton will benefit from a new focus on issues that will come as the campaign moves into the platform-negotiation stage. Like my colleague John Nichols, I’m excited by the progressive majority on the platform committee, and happy that Clinton and chair Debbie Wasserman Schultz, not just Sanders, appointed genuine progressives. This is a party strong enough to endure some debate—on the issues, not personalities. I know there’s a vocal segment of Sanders supporters who say they won’t support Clinton, and who echo debunked right-wing talking points as they do so; I believe they’re a minority, and that with Sanders’s strong support, she’ll win them over. Speaking only for myself, I think she can reach accommodation with Sanders on the minimum wage and on banking reform; single-payer healthcare is probably a non-starter, but robust support for a public option and/or buying into Medicare for those 50 and over seems possible. I would love to see Clinton and Sanders unite behind a real proposal to promise not merely debt-free college to those beginning their college careers but a debt-relief plan for those already saddled with student loans. Sanders speaks to the desperation of a younger generation that is either crushed by debt or locked out of higher education because it’s too expensive; Clinton needs to hear that and speak to it. The platform committee hasn’t begun to deliberate; there will be many more ideas to consider. But I’m a Clinton supporter who thinks it’s possible to unite the Democratic campaign around big ideas, and diminish an opponent who uses insults to distract from his smallness.